A native of Pocomoke City, Maryland, Wes Lockfaw holds degrees in sacred music from Catawba College in Salisbury, North Carolina as well as from Southern Seminary in Louisville, Kentucky. 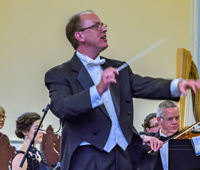 Additionally, he has done graduate work at Westminster Choir College in Princeton, New Jersey studying conducting under Joseph Flummerfelt and performing under several of the world’s leading conductors, including, Kurt Masur and Wolfgang Sawallisch. A very talented and accomplished organist, pianist, and choral director, Wes Lockfaw has led music ministries in seven states as well as having served as a choral adjudicator, clinician, and piano instructor in a college environment. Mr. Lockfaw has conducted musical programs featuring many artists from the national and international communities and has produced numerous recordings including John Rutter’s Magnificat and Mark Hayes’ Te Deum, featuring the Sanctuary Choir and Orchestra of Virginia Beach United Methodist Church. In 2013 the Christ Church Choir under Mr. Lockfaw’s direction recorded Bach Cantata No. 93 and Antonio Vivaldi’s Gloria. In January of 2009, he accepted the position of Organist and Music Director at Christ Church Episcopal in Easton, Maryland where he directs numerous ensembles including the Christ Church Choir which performed at historic Bruton Parish in Colonial Williamsburg, Virginia in July 2014. In 2010, he became Easton Choral Arts Society’s fifth artistic director. Since arriving in Easton, Mr. Lockfaw has initiated several ensembles including the Christ Church Choral Scholars, an auditioned ensemble ranging from high school to collegiate level students, and in 2017, the Christ Church Community Boychoir. Recent performances under Mr. Lockfaw’s direction include Carl Orff’s Carmina Burana with the Easton Choral Society, Gounod’s St. Cecilia Mass, Dubois’ The Seven Last Words of Christ, Mendelssohn’s oratorios St. Paul and Elijah, Mozart’s Exultate Jubilate, Coronation Mass, and Requiem, and Benjamin Britten’s Ceremony of Carols. As well as having a fine tenor voice in his own right, Mr. Lockfaw is the recipient of an impressive list of honors and awards and has been instrumental in the establishment of many choral and bell ringing programs for children and adults. He holds memberships in the American Choral Directors’ Association, the Choristers’ Guild, the American Guild of Organists, Handbell Musicians of America, and the Royal School of Church Music. Currently, he is Dean of the Mid-Shore Maryland Chapter of the American Guild of Organists which he was instrumental in founding in 2014. Accompanist for the Easton Choral Arts, graduated from West Chester State University with a Bachelor of Music Education in 1975. Becky received a Master of Education degree with a music concentration from Salisbury State University in 1981. From 1976 to 1996 she served as organist and choir director at Immanuel Lutheran Church, Preston. Rebecca is presently Director of Music at St. Luke's U.M.C. in Denton, having served in that position since 1996. She is a retired Caroline County Public School music teacher having taught at Greensboro Elementary School for 30 years. 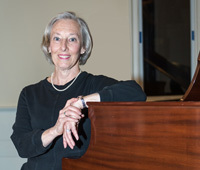 Rebecca Zinser has served as rehearsal accompanist for Easton Choral Arts since September 2009, and as Concert Accompanist on Piano and Organ.